I was honored to be invited to deliver the keynote remarks at the UW-Madison Bolz Center’s Arts Business Research Symposium March 13-14. I previewed those remarks here and am posting the full text serially over the next several days. The talk was originally titled “Not about the Benjamins: Arts Entrepreneurship Research, Practice, and Education.” Here’s it’s just called “The Ouroboros.” This is part 5. Where does the actual work of arts/business interaction happen? Once we accept that the end result of such relationships is art rather than money, we see these interactions happening in new and interesting ways in the domain of socially engaged practice. I’m delighted to see Sonya Manjon on the program here, because I want to hear about her work as an artist/researcher who both undertakes community collaborations and studies them. 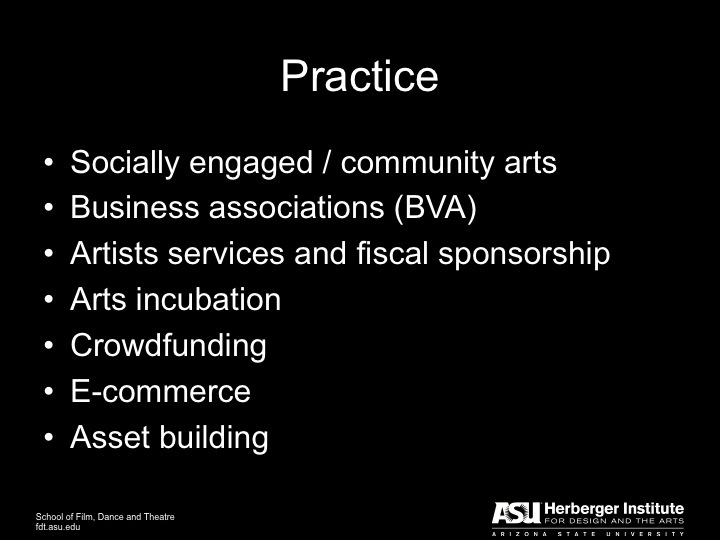 There’s a long history of arts/business associations like “Business Volunteers for the Arts.” I don’t know if where you are is anywhere like Phoenix, but our local chapter dissolved three years ago during the height of the recession. Its signature “business on board” program is being administered by a state-wide arts advocacy organization, but I wonder if that particular incarnation of arts/business relationship is waning elsewhere. An important aspect of arts business practice is the infrastructure afforded for undertaking and launching an arts-based venture. Fiscal sponsorship and arts services organizations that provide other kinds of shared business services are a critical part of that infrastructure. Fractured Atlas is well-known for providing that kind of support for individual artists and fledgling arts organizations. I’m delighted that Noah Keesecker is here from Springboard for the Arts, an organization that provides arts business infrastructure support for artists in Minneapolis and elsewhere in Minnesota, making, to paraphrase their executive director Laura Zabel, “a living and a life” possible for artists. My own research touches on the infrastructure for arts venturing. There are over forty arts venture incubators in the US, some focusing more on the incubation of art and others focusing more on the incubation of creative industry businesses, but all of them are part of the landscape of arts business activity. In that context, one observes the full spectrum of arts entrepreneurial activities – from individual artists learning sound business practices, to new businesses forming in the creative industries. And then there’s crowdfunding, and its cousin e-commerce. It’s been a widely tauted statistic that kickstarter distributed more funds to arts projects than did the NEA over the last two years. I view kickstarter and the other crowdfunding platforms (indiegogo, Rockethub, etc) as another – and very useful — tool for artists and arts orgs to feed the Ourobos – to get more money to generate more art. But we may be starting to see a saturation point there as well – with so many projects to fund, will the dollars for funding continue to grow? Time (and maybe a PhD dissertation in cultural economics) will tell that story. Related to this area of support services for artists and small arts organizations is the area of asset building. Art Home, for example, helps artists build their asset base through savings and even homeownership so that they can sustain their lives as artists. This entry was posted in Arts entrepreneurship, Arts funding, arts infrastructure, Arts management, Uncategorized and tagged BVA, crowdfunding, fiscal sponsorship, Fractured Atlas, indiegogo, kickstarter, rockethub, socially engaged practice, Springboard for the Arts. Bookmark the permalink.